Hello everyone, I hope you are all enjoying fall. 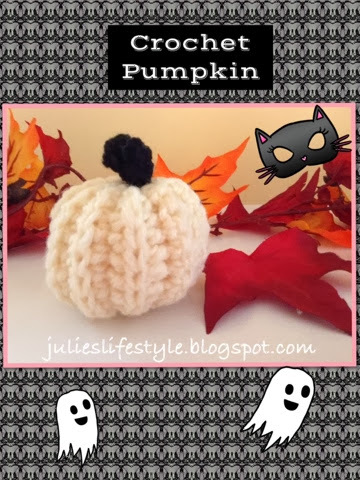 I shared with you all the mini crochet pumpkins that I made last year HERE and the pattern to make them is HERE in a recent post. 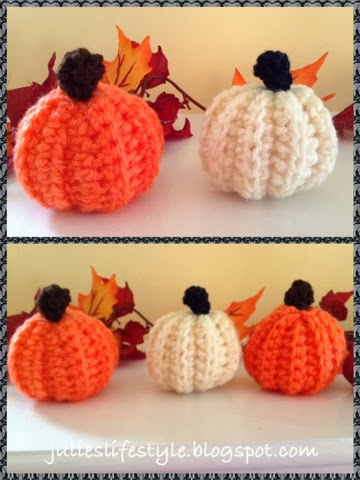 Well, I have been busy for the past few weeks crocheting these little mini pumpkins in all sorts of colors. I made white pumpkins with a black stem which are all the rage in blog land right now. And this deep orange color with a brown stem! Here are my little crocheted pumpkins sitting in the fall leaves. And more little pumpkins! Look how cute they look sitting together. Below you can see my mantle is decorated with my mini pumpkins. Notice on the left there is a white pumpkin missing. Well, I am still in the process of making it. I need to sew it up. The painting in the background I painted when I was in high school. I do need to make a burlap wreath for next year to hang there. I used tiny cotton balls to stuff the pumpkins. 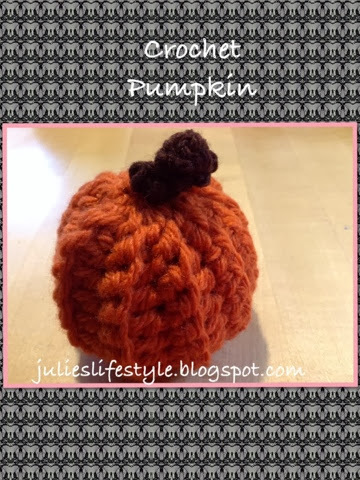 There is still time left to make some mini crocheted pumpkins for fall and Halloween. I hope I have inspired some of you to create one. They are so much fun to make and I will be making a few more for some of my friends in my crochet group since I have a lot of yarn left over. The white yarn is Caron in the color Fisherman White. The deep orange yarn is Lion Brand Yarn Wool-Ease Chunky in the color 133 Pumpkin. 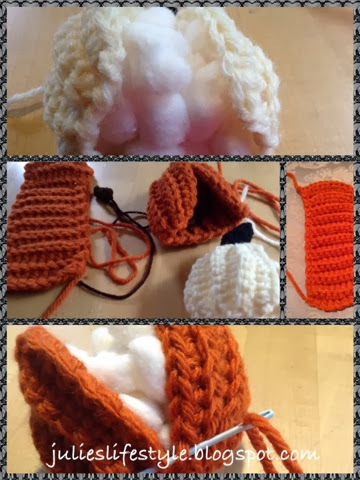 The bright orange yarn is Lion Brand Yarn Vanna's Choice in the color Radiant Orange. The black yarn is Red Heart Super Saver in the color 0312 Black. The brown yarn is from Red Heart (I don't have the label) but the yarn color is dark brown. 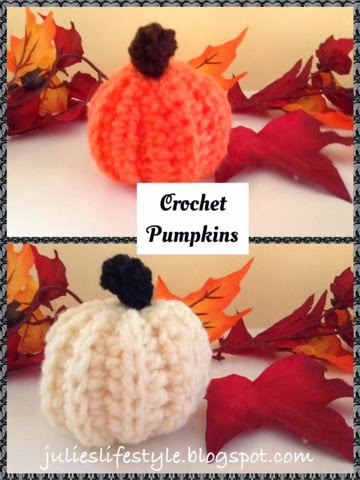 If you want to crochet these pumpkins you can use whatever yarn you have and color. 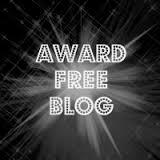 I also want to thank and welcome all my new followers to my blog. Thank you for all your sweet comments, they mean a lot to me. 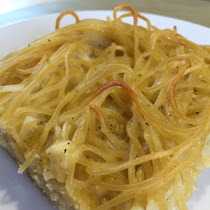 I also would like to thank all the wonderful friends that I have made in blog land who have featured me on their blogs with all of my crochet creations and my recipes! Thanks it means so much to me. Hi Oliva, thanks for your sweet comment and have fun making your pumpkins. Pumpkins are so much fun to make! Hi Chel, thanks for your sweet comment and have fun making the pumpkins! These are adorable! Wish I could crochet so I could make some for myself! Thanks for sharing at Share Your Stuff Tuesdays! Hi Emily, thanks for your comment and it takes a lot of practice, but it's fun once you learn. Julie, I saw these on Kathe With an E and had to come over here and get a better look! I love anything to do with fall and pumpkins, so I really fell for these! You are so artistic and creative- that painting you did in high school is lovely. Old churches are wonderful- do you have a larger picture of the painting? 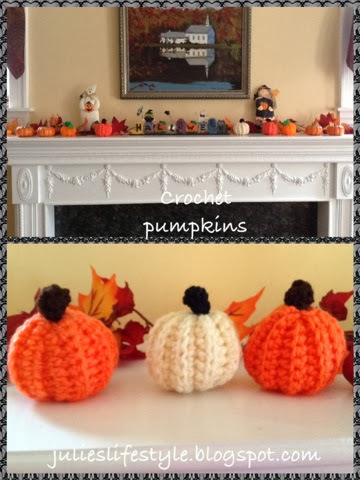 Thanks Joy it was so much fun crocheting the pumpkins for fall and thanks for the compliments. Hi Fabby, your welcome and I had a good time with making the pumpkins for fall. Thanks for your nice comments, it means a lot to me. 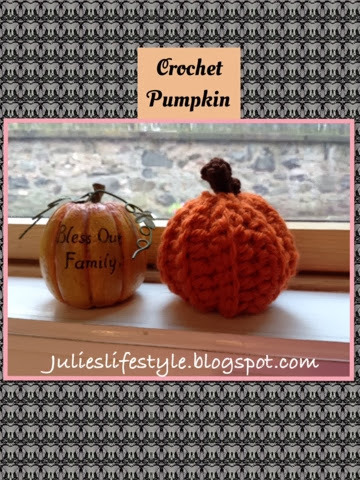 These are great Julie, Thank you so much for sharing your pumpkins over at Krafty Cards etc. Thanks Maria and welcome to my blog! I really should learn to crochet, I just never can find the time to sit down and do it. Those pumpkins are soo cute! These are too cute!!! I have been trying to stock up on holiday decor since most of it was left behind when I got married and moved out of state. I will have a ton of these made up for next year for sure! So adorable. Thank you for the pattern. Such a cozy autumn mantel with your mini crocheted pumpkins filling the leafy ledge with bright orange hues and providing soft, seasonal views! Love the pumpkins on your mantle! Beautiful autumn colors. I aww'ed when I saw these! THE cutest pumpkins I've ever seen! Thanks for stopping by and leaving that nice comment on my Capri post! These little pumpkins are so cute. My grandmother tried to teach me to crochet once but she wasn't very patient. I'd love to learn! you have the most amazing little pumpkins!! These are too cute. Makes me wish I could crochet. Julie these are so cute! Sometimes things come in small packages. Lol! I really need to learn how to crochet. Thanks for sharing them with SYC. Hope you have a wonderful weekend and week! Hi Ruby, I am so glad you like the mini pumpkin I crocheted for you! Thanks for your sweet comment. Take care. Hi Rhondda, thanks so much for the feature this week at your link party! You just made my day and I appreciate it! :0) Wishing you a wonderful day and week. These little pumpkins are soooo cute! 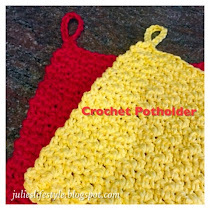 I wish I could crochet to make them :) This will be a featured craft @ Great Idea Thursday's! You've got me wishing I could crochet. A former co-worker tried to teach me once. She was right handed and I'm a lefty. We (I) just couldn't get it together. Your pumpkins are beautiful! Thanks for sharing at Throwback Thursday. These are on my list to crochet, Thanks for sharing the pattern! Oh how cute. I wish I crocheted better. Not too good at reading patterns. 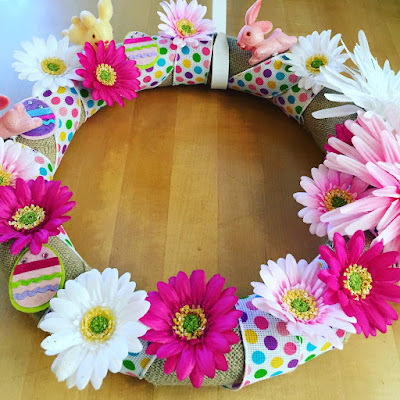 I could see these as a garland. How cute would that be! Or on that Fabulous Fall/Thanksgiving tree in my post! Love them. Thanks for linking! These are adorable! I love the lighter colored ones. Thanks for sharing. How adorable are those!!! I don't crochet but my daughter does so I'll be sharing this post with her, for sure! Visiting through The Journey Back fall linky party. These are such adorable little pumpkins! I really love your mantel decorations. Thank you for sharing at my Yarn Fanatic Party! :-) Hope to see you again! So pretty...love them AND love your beautiful fireplace. Wow, the details are spectacular! LOVE, LOVE these! I do hope you will share these at the Merry Monday party! Very cute. Perfect fall decorations. These are so adorable! 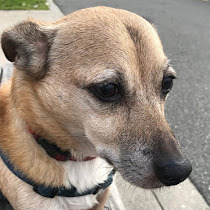 I've chosen your post as my feature pick for next week's Merry Monday link party. I hope you'll stop by to grab an "I was featured" button! The party starts on Sunday at 6PM Pacific! 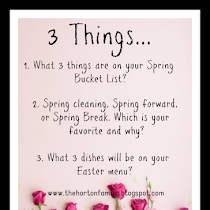 They are so cute - I am going to make a few - Thanks for linking up to Pin Worthy Wednesday, I have pinned your post to the Pin Worthy Wednesday Pinterest Board. Your crocheted pumpkins are adorable. I love to crochet but have not done much lately. Maybe I can get inspired.